Samsung currently have £200 off the Note 9 if you login to their student/staff discount site. They are also offering £150 cashback. If you include the cashback I don't think there's a better price for the UK-spec phone, and currently probably for any Note 9 import either. 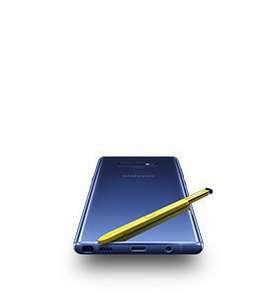 Also instant up to a further £200 off for trading in an old Samsung/iPhone - could you get the Note 9 for £349? "Currently they have 1,565 stock of the Ocean Blue 128gb. 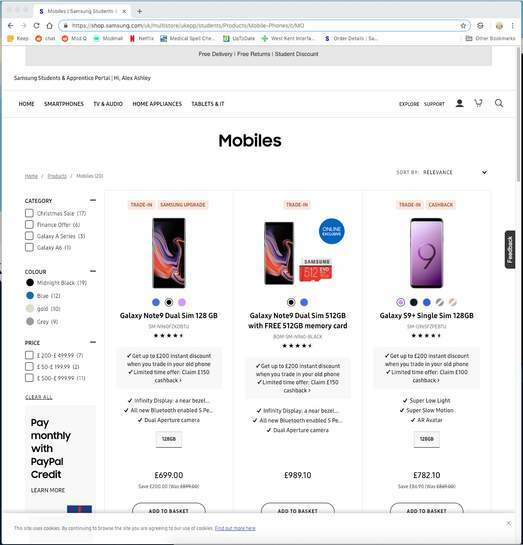 And I just got off the phone talking to the "Samsung Shop Team on 0330 726 7467 / support@samsunguk.zendesk.com" as directed by the webchat and they said you can claim the £150 cashback as long as you don't do the trade in or the upgrade program"
UniDays is needed to get the Student discount. Good price, but how on earth do you justify £550 on a phone as a student, unless you're directly sourcing an income from owning this device? Good price, but how on earth do you justify £550 on a phone as a student, …Good price, but how on earth do you justify £550 on a phone as a student, unless you're directly sourcing an income from owning this device? How many users on this site do you think have access to student codes that are actually a student? I emailed Samsung (claims department) this morning asking why my claim went from validated to processed then back to validated. This is the reply i got not long ago. Apologies for any confusion this has caused you. The status processed means your claim has been provisionally approved. The status of your claim will then change to Validated which means your claim has been approved. Once it shows Validated your claim has been completed and as per our Terms and Conditions "Participants will receive the Reward by way of bank transfer to the bank account detailed in the Claim within thirty 30 days of Claim Validation". I confirm that your claim has been definitively validated on December, 13th and is now processing and preparing to send payment. Hopefully this will be clearer for you. If you require any further assistance, please do not hesitate to contact us. So by this it means anyone who's claim says 'Validated' has been approved and preparing to send payment according to the reply i got above. Just hope they hurry up, defective phone picked up yesterday, hope i get replacement before christmas, might ring tomorrow afternoon if i don't here anything, don't want phone stuck in a warehouse over christmas. Does trade-in invalidate the cash back element? will they honor 150 pounds cashback. usually these types of cashback comes with a condition "not in conjunction with other offers"
I got this yesterday through work. Traded in an old iPhone 4s for £75. Will work out to £474 for me, once the cashback comes through. Great deal. Good price, but note that the trade in price is up to £200, not a guaranteed £200. For example, an S7 Edge gets you £150 off. Well, we'll soon find out about the trade in / cashback viability - just ordered, with Note 4 trade in for £150. If all works out will have a new Note 9 for £399 Thanks OP!! Will update here as trade-in / cashback progresses! How many users on this site do you think have access to student codes that …How many users on this site do you think have access to student codes that are actually a student? It's also this price on staff discount site, such as Wider Wallet, assume same for NHS staff etc? The website shows the price as £699 and trade in/cash back in the same screen so should be able to claim together. Very tempted, trading in my S8 Plus will get me a Note 9 for £299 after cashback! Is it worth it over the S8 Plus? It's also this price on staff discount site, such as Wider Wallet, assume …It's also this price on staff discount site, such as Wider Wallet, assume same for NHS staff etc?The website shows the price as £699 and trade in/cash back in the same screen so should be able to claim together. Blue light discount card (NHS workers) are eligible too! Terms & Conditions Discount is only available to verified UNiDAYS members. Cannot be combined with other vouchers and on-site promotions. part time job, while being a full time student + maintenance loan. The online site shows both the £200 discount and the £150 cashback. They also have a 28-day "change of mind" policy so not really much danger here. Just to comment on phone: I have the S9+ dual which was via german Amazon earlier this year - amazing bit of kit. Delighted with it, and the dual sim works seamlessly. Can call from either sim and get texts and calls to both. If the note is anything like it (I assume the hardware is the same around the sims) then it's great. This looks a fab price. 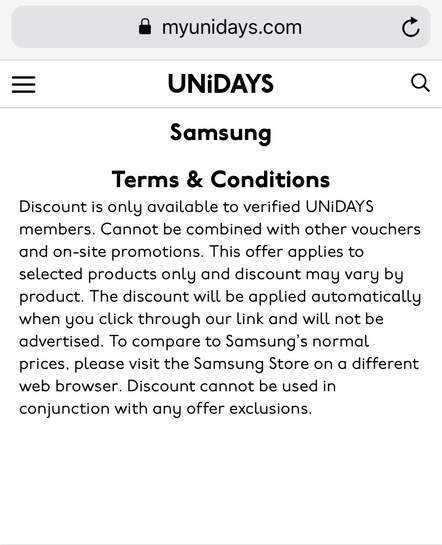 I'm inclined to think that the offers clearly advertised on the Samsung Student site (as shown by the apjashley) override the fairly general wording on the Unidays page. Certainly enough to make a fuss about it if they mess about. Will be sure to get the claim in immediately following receipt, and lets see what happens. Can the cash back be claimed within the 28 day window you talk about? Did this cashback deal with a Galaxy S9 last week seems the cashback deal is more hassle than its worth. I sent all the information they asked for image of order confirmation, image of box with imei and serial number once delivered, then got an email back saying they wanted more information regarding delivery notes you have 7 days or we decline your cashback. These companies will find any way to get out of paying you the cashback so they try to make it as awkward as possible. Still not sure if i'm going to receive this "cashback" I will be wary of any cashback offers in future. From the T&Cs, you can submit the claim immediately (once you have the phone), and should receive a confirmation that your claim has been received, and then another to say it has been accepted, within 7 days. So plenty of time to chase or back out if something doesn't seem right. Did this cashback deal with a Galaxy S9 last week seems the cashback deal …Did this cashback deal with a Galaxy S9 last week seems the cashback deal is more hassle than its worth. I sent all the information they asked for image of order confirmation, image of box with imei and serial number once delivered, then got an email back saying they wanted more information regarding delivery notes you have 7 days or we decline your cashback. These companies will find any way to get out of paying you the cashback so they try to make it as awkward as possible. Still not sure if i'm going to receive this "cashback" I will be wary of any cashback offers in future. Where did you buy from out of interest? I'm hoping a purchase direct from Samsung should be reasonably simple, though I'm sure there will still be a few hoops to jump through. Stupid question, only Samsung directly sell the hybrid sim in the UK, would it be worth more in value over the single Sims? "Enjoy having the upper hand in every exam, and the tools to realise your ambitions." How does one get a unidays code without being a student?